Every year, we record the people executed by governments around the world, and publish the figures. This helps us see which governments are continuing to use the death penalty and campaign for its end - and to show that over the years use of the death penalty is very gradually declining. At least 1,032 people were executed in 23 countries around the world in 2016. This is a big step down from 2015, when executions were at their highest for 25 years. Our figures do not account for the number of people executed in China - where executions are a state secret, so we are unable to count and verify the numbers of people killed by the state. We believe it to be in the thousands. Most executions in 2016 took place in China, Iran, Saudi Arabia, Iraq and Pakistan – in that order. China remained the world’s top executioner. 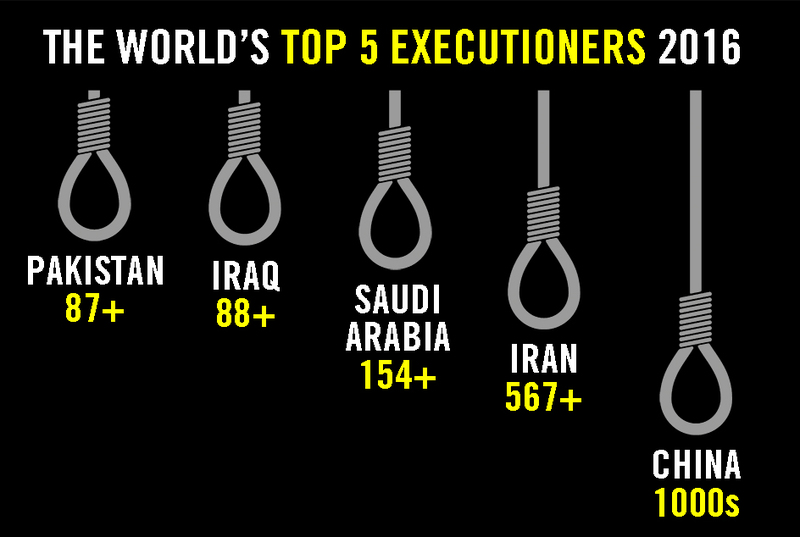 For the first time since 2006, the USA was not one of the five biggest executioners, falling to seventh behind Egypt. The 20 executions in the USA was the lowest in the country since 1991. During 2016, 23 countries, about one in eight of all countries worldwide, are known to have carried out executions. This number has decreased significantly from twenty years ago (40 countries carried out executions in 1997). Belarus, Botswana, Nigeria and authorities within the State of Palestine resumed executions in 2016; Chad, India, Jordan, Oman and United Arab Emirates –all countries that executed people in 2015 − did not report any executions last year. At least 18,848 people were on death row, awaiting their execution, at the end of 2016. We recorded 3,117 death sentences in 55 countries in 2016, a significant increase on the total for 2015 (1,998 sentences in 61 countries). We recorded significant increases in death sentenced for 12 countries, but for some, such as Thailand, the increase is due to the fact that the authorities provided us with detailed information that we had not had access to in previous years. Our records cover 'judicial use of the death penalty' - that is, where governments have sentenced prisoners to death before a court or executed them - for a calendar year (in this case, January to December 2016). These numbers are minimal figures, where we have enough information to corroborate an execution or death sentence. The true numbers are likely to be higher. We get our information from a variety of sources, including figures published by states; information from individuals sentenced to death and their families and representatives; reporting by other civil society organisations; and media reports. Many governments do not publish information on their use of the death penalty. In Belarus, China and Vietnam, data on the use of the death penalty is classified as a state secret. During 2016 little or no information was available on some countries – in particular Laos, North Korea, Syria and Yemen – due to restrictive state practice and/or armed conflict.